For my Blogging Challenge, I've decided to create a painting a day--something I've long wanted to try. My subjects for this challenge will be mostly animals. Animals are not a subject I often tackle. 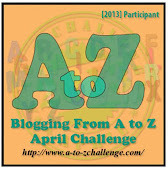 The A to Z Challenge is nearing the end. I've been creating a new animal painting each day. This week has been a special challenge for me because every day I've also been taking an amazing art workshop that was especially intense. At the end of each workshop day, I've painted a new artwork and needed to photograph it and post my blog prior to leaving the art facility before 6 p.m. For that reason, I've kept all the blog posts short. I also have been unable to go visit other bloggers in the Challenge. I'll try to make up for that when I return home. "X" is for X-Ray Tetra, an exotic transparent fish native to the Amazon River in South America. This colorful fish is popular for home aquariums. 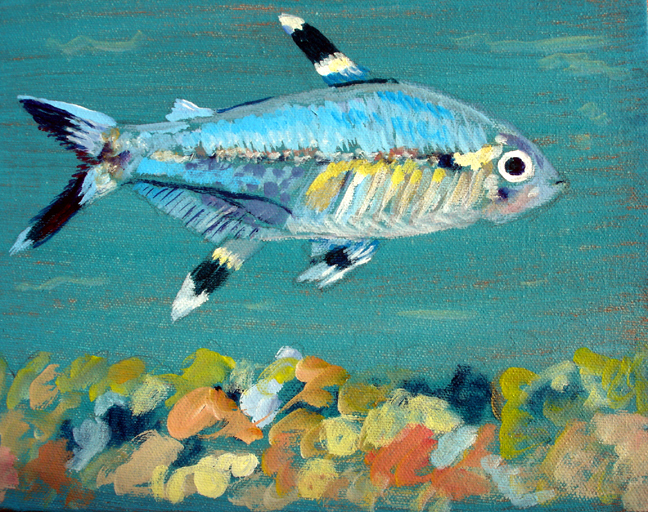 "X-Ray Tetra" is 10" x 8" acrylic on stretched canvas. This is the 24th painting in the Painting a Day series for the A to Z Challenge. WEST POINT Author Mary Montague Sikes was among 41 members of Virginia Press Women who received awards in the 2013 Communications Contest during the Spring Conference at Washington and Lee University on April 13. Categories including newspaper writing, public relations, advertising, photo journalism, Internet and magazine writing, and books were judged by 10 experienced journalists and public relations professionals. Entries that received first place advance to the National Federation of Press Women contest. Her book, Daddy's Christmas Angel received the first place award for adult novels. This heartwarming story for all seasons is set in a fictitious small town in Virginia and was inspired by the movie Sleepless in Seattle. Sikes also received a second place award for Blogs - Personal. Her entries were: "Falling in Love with Encaustic Painting-Where Will It Lead? ", published November 26, 2012, and "Can There Be Peace on Earth in 2013? ", published December 31, 2012. Her blog Notes Along the Way - Mary Montague Sikes http://marymontaguesikes.blogspot.com has attracted more than 80,000 page views. An artist as well as a writer, Sikes is based in West Point. She will teach an all-day art workshop, "Pastels Bold and Free" at This Century Art Gallery Education Center in Williamsburg on May 4. On May 11, she will participate in a group book signing, "Celebrate with a Book", at Regency Mall Square in Richmond from 10 a.m. to 4 p.m.